Summary of today’s show: Scot Landry and Fr. Matt Williams discuss two of the speeches by bishops at the ongoing Synod for the New Evangelization in Rome, the first by Cardinal Timothy Dolan on the Sacrament of Reconciliation as the engine of the New Evangelization and the second by Archbishop Claudio Maria Celli on the importance of the new media in sharing the New Evangelization, especially with the young. Meanwhile, the Fall fund drive for WQOM has started this week. To support the work of WQOM and The Station of the Cross, which brings Catholic programming like The Good Catholic Life to the Boston area, please be as generous as your means permit with your gift or pledge. 1st segment: Scot Landry and Fr. Matt Williams welcome everyone to the show. Fr. Matt talked about their monthly gathering with young adults in the Archdiocese at St. Leonard’s in the North End of Boston, called Jesus in the North End. They stand in the street to invite people in to pray before the Blessed Sacrament and they also have confession available. This month, some of them handed out cards to people in the street on why Question Two for physician-assisted suicide is a bad law. They didn’t do it in front of the church in order not to make an inappropriate connection with the prayer service. Scot asked how many hadn’t heard about question two. Fr. Matt said most of those coming to the event regularly tend to be informed Catholics. Fr. Matt’s team still invited them to learn even more to be able to share with their friends. Scot asked Fr. Matt what it means to him to set the world ablaze with faith on fire, which is the theme of the Fall Fund drive for WQOM. He said when you fall in love, it affects, forms, and shapes everything you do. Being on fire with faith means to be in love with Jesus. You want to share that love, you want others to know that amazing love. Scot said today they will be reading some of the moving interventions going on at the Synod of the New Evangelization in Rome right now. He said the talks from each of the bishops attending tend to be short and powerful and on one topic. The first will be Cardinal Dolan talking about the Sacrament of Penance as being key to the success of the New Evangelization. But first, Scot asked Fr. Matt what he hears from young people about the importance of Catholic radio. He said young people are engaged in media on average 8 hours per day, sometimes multiple ones. He said when young people are invited, they become engaged. He said young people often mirror their parents’ habits and so parents can influence their children’s habits. Break for Fund Drive Appeal. To support the work of WQOM and The Station of the Cross, which brings Catholic programming like The Good Catholic Life to the Boston area, please be as generous as your means permit with your gift or pledge. 2nd segment: Scot and Fr. Matt will now talk about the intervention of Cardinal Timothy Dolan of New York at the synod of bishops. The New Evangelization reminds us that the very agents of evangelization must first be evangelized themselves. We must first come to Jesus ourselves before we can go out to others in His Holy Name. Thus I believe that the primary sacrament of the New Evangelization is the sacrament of penance, and thank Pope Benedict for reminding us of this. Yes, to be sure, the sacraments of initiation – – Baptism, Confirmation, the Eucharist – – charge, challenge, and equip the agents of evangelization. But, the sacrament of reconciliation evangelizes the evangelizers, as it brings us sacramentally into contact with Jesus, who calls us to conversion of heart, and inspires us to answer His invitation to repentance. As we learned in philosophy, nemo dat qoud non habet (“no one gives what he does not have”). The Second Vatican Council called for a renewal of the sacrament of penance, but what we got instead, sadly, in many places, was the disappearance of the sacrament. So we have busied ourselves calling for the reform of structures, systems, institutions, and people other than ourselves. Yes, this is good. I am! Admitting that leads to conversion of heart and repentance, the core of the Gospel-invitation. That happens in the Sacrament of Penance. This is the sacrament of the New Evangelization. Scot loves how the intervention starts. Before we are sent to help others, Jesus calls us to come to him, to enter a close relationship with him, to let him work through us. Fr. Matt said in Mark’s Gospel when Jesus calls the Twelve, it says he called them to be with him and to be sent forth. We must be fed before we can feed others. For three years, he formed and taught them. Fr. Matt referred to an article by Dr. Peter Kreeft called “The Winning Strategy”. He said we are at war and we need to recognize the enemy. First, it is Satan and second it is sin, which is in all of us. Because we can cooperate with evil, we can become devils. But the winning strategy is that by cooperating with good, we can become saints. Scot said Dolan wrote that confession evangelizes the evangelizers. It brings us into contact with Jesus with conversion of heart. Extremely holy people go to confession at the time. You become a saint and become holy by going to confession. Fr. Matt said conversion is a daily reality. Jesus says we have to pick up our cross and follow him daily. Cardinal Dolan said in some places, the sacrament has fallen away in the practice of the church. Scot thinks of how often we’ve talked about the Sacrament of Reconciliation on this show and how many people may have returned to the practice of confession. Fr. Matt said when you talk to young people about the sacrament of reconciliation and how Christ calls us to be holy, suddenly the want that because they recognize that what they’ve been seeking in the world doesn’t satisfy the hungry heart. 3rd segment: Scot said he and Fr. Matt are back to the discussion of the Synod for the New Evangelization. He said the reason for this topic was the Holy Father getting input from bishops who said there many Catholics who had received the sacraments of initiation and were no longer connected to the Church in a meaningful way. Fr. Matt said it’s not about a new program. The program is Jesus Christ. It’s recognizing that the audience has shifted. It’s geared toward those who have been baptized but for whom the faith has grown cold. He said in Massachusetts, it’s the most Catholic state where 44% are Catholic, but we’re also the most secular state. We’re also significantly losing the battle to protect all human life. Because we call ourselves Catholic, it doesn’t mean JEsus is an active part of our life. So we need new ardor and means of expression of the faith and we need to renew and convert ourselves to more effectively proclaim the Good News. Scot said many of the interventions deal with using media to proclaim the Good News. He quoted from Archbishop Claudio Celli’s intervention. The archbishop is head of the Pontifical Council for Social Communications. The new evangelization asks us to be attentive to the “newness” of the cultural context in which we are called upon to proclaim the Gospel, but also to the “newness” of the methods to be used. The New Media are radically changing the culture in which we live and offer new paths for sharing the message of the Gospel. The new technologies have not only changed the method of communicating, but have also transformed communication itself, creating a new cultural infrastructure that is influencing the environment of communication, and we cannot simply continue to do what we have always done, even with the new technologies. The digital area is not a “virtual” space, less important than the “real” world, and if the Gospel is not also proclaimed “digitally”, we run the risk of abandoning many people, for whom this is the world in which they “live”. The Church is already present in digital space, but the next challenge is to change our communicative style in order to render such a presence more effective, occupying ourselves above all with the question of language. In the digital forum discourse is spontaneous, interactive and participatory: in the Church, we are used to using written texts as our normal method of communication. I do not know if this form can speak to the young, who are accustomed to a language rooted in the convergence of words, sounds and images. We are called upon to communicate our testimony, sharing in personal relationships the hope that resides in us. We cannot dilute the content of our faith, but rather find new ways of expressing it in its fullness. We are obliged to express ourselves in a manner that involves others who, in turn, share our ideas with their friends and “followers”. We need to valorize the “voices” of many Catholics present in blogs, so that they might evangelize and present the teachings of the Church which is called upon to initiate a respectful dialogue with all, to give a reason to all for the hope we carry in our hearts. 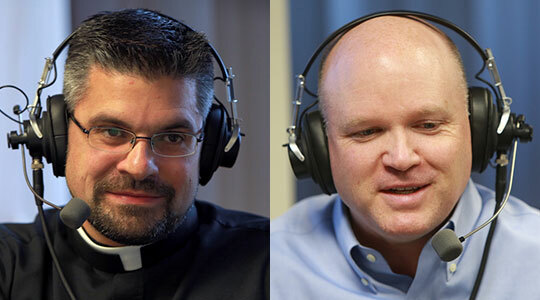 Scot said everything the archbishop said can be said of Catholic radio. Fr. Matt said St. Paul says that faith comes by hearing. The Holy Father says his hope is in that the human heart is ultimately longing for God; the truth of Jesus Christ is the same yesterday, today, and forever, and that Jesus invites everyone into a personal friendship with him and has promised to stay with us forever; and the Holy Father knows that a fast food of things of the world will never satisfy and this is the opportunity for the Church to proclaim those things which will satisfy.